How often do we return home from summer breaks and think that if it weren’t for the weather we’d have been better off staying at home? Perhaps that question will divide holidaymakers, but on the side that agrees we are able to pull flaws in various purpose built resorts around Europe. Maybe the problem is our choice of destination having been bamboozled into believing the hype. With a little research online you could easily look at a destination that has the odd theme park or UNESCO World Heritage Site that will give us something new to contemplate each day. Of course there are many people who are more than happy with a bar, beach and sun lounger as their summer jolly’s are all about relaxing rather than exploring, but it doesn’t hurt having options in reserve. Tenerife is a top choice for tourists over summer because it does well at combining the options of relaxation and exploration. Those who love all things nature will marvel at what options are available. Spend a glorious day ascending up El Teide, with the aid of a cable car, which is the highest mountain in Spain. Views from the top allow you see every corner of the Island and on clear days even further beyond. Keen hikers can also enjoy a wander around ‘Parque Rural de Anaga’ which is a great way to become fully submerged in the flora and fauna of the Spanish Island. Away from all the obvious beauty of the island you are also able to find more modern attractions, something which is perhaps more appealing to the main demographic of tourists to the island. Places such as Siam Park which is a large water park located in the popular resort Costa Adeje based along Tenerife’s south western coast. Loro Parque Zoo is a very popular attraction for all tourists who come to the island, although located in Puerto de la Cruz practically every resort offers tours and transportation to the zoo. 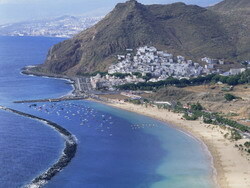 Tenerife holidays have been labelled more of a ‘party destination’, due to the rise in popularity of places such as Playa de las Americas. The resort has plenty of late bars and clubs that go into overdrive during the summer months and there is also a large manmade beach that can accommodate the large number of tourists travelling during the busy period. While places that insist they accommodate everybody in terms of what they can offer for a summer holiday, you will find that holidaymakers often do the opposite. Some looking for a lively experience will go to places where families and couple don’t go to so that they aren’t disturbing anyone, whereas families and couple will go to more reserved resorts to avoid being disturbed. However, Tenerife comes as close as most places for offering that good amount of variety and neighbouring resorts to allow everybody to holiday in harmony.